Were you wondering where the four – Javed Jaffery, Ritiesh Deshmukh, Arshad Warsh and Ashish Chaudhary were lost all the while? Did you miss their gags and fun moments which made you smile and laugh in equal measure in “Dhamaal”? 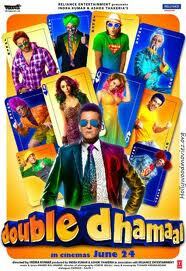 They are back along with Sanjay Dutt in Double Dhamaal to tickle your funny bones. This is what the trailer of “Double Dhamaal” promised to all and sundry. But does it love up to its promise?